"Chosen by the gods, to restore the glory of an empire!" Gladiator: Sword of Vengeance is the latest action arcade game that puts players into the role of Gladiator that not only pays homage to the old arcade games of the 1990's but also to almost every Gladiator movie that has been released by Hollywood. When the corrupt emperor of Rome, Arruntius, conquered the old regime of the Roman Empire, he vowed to rebuild Rome in his own image and murdered anyone who got in his way. Unfortunately for Arruntius, a lone gladiator stood in his way and in order to rid the mortal realm of Invictus Thrax, Arruntius prayed to the dark gods of Rome, Phobos and Deimos to banish this mortal. Although Arruntius was successful in unfairly murdering Invictus Thrax in a rigged gladiatorial tournament, the child gods called Romulus and Remus have other plans for this mighty hero. Unimpressed by the meddling of Phobos and Deimos, Romulus and Remus have set a task for our hero Invictus Thrax that will not only restore the glory of Rome but will also bring out hero back to the mortal realm to help liberate Rome. The gods Romulus and Remus have created a harsh challenge for Invictus Thrax and he must now battle his way through not only the Alesian fields but also the fiery pits of Hades where he must battle undead skeletons, minotaurs and various other mythical beasts of the Roman mythology such as Medusa herself. 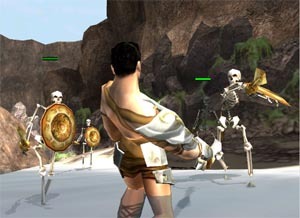 Gladiator: Sword of Vengeance is traditional arcade "hack" and "slash" where the player must use a variety of ancient weapons to defeat a plethora of nasties. The beauty of Gladiator: Sword of Vengeance is that as your character progresses through the various levels and personal challenges, he slowly becomes more and more powerful that not only gives you access to variety of special moves but also to various weapons. The control system of the title is extremely easy to pick up and will have you playing like a true Gladiator warrior in no time. The analog sticks are used to control your character in the gaming environment with the right stick used to zoom in and out of the game. To engage Invictus Thrax in battle, you must use the d-pad to perform a variety of deadly manoeuvres and by pushing certain button combinations, Thrax performs a variety of different attack combinations. The title also boasts an auto-aim feature that automatically locks onto your first enemy that you engage in. Although this is ideal for encounters against one-on-one combatants, it does become a little frustrating when you are trying to destroy "key" objects in the game when you are trying to ignore your enemies. For instance, on the personal challenges, you must destroy huge wooden barrels in a set time but when the game throws in a hundred undead skeletons, it becomes extremely difficult. In order to bypass the auto aim system, you must use the shoulder buttons to select or deselect a target. I must admit that Acclaim done a brilliant and extremely violent job on the battles that you face in the game and it brings back fond memories of the Amiga 500 game called Barbarian that allowed you to chop off various bodies parts from your enemies. 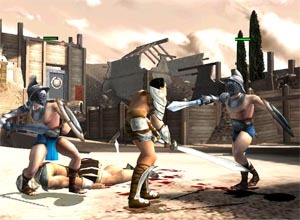 Gladiator: Sword of Vengeance has a similar battle system whereby arms, heads and thousands of litres of blood is sprayed across your gaming environment. The enemies in the game start from your traditional Roman gladiators but in the world of the gods, you soon start encountering more difficult opponents such as Minotaurs and Cyclops. Another annoying aspect of the title is the extremely unfriendly save points that sometimes makes you start from the beginning if you are cut down in battle. This can be very frustrating, especially if you have completed some personal trials. The game also contains a variety of puzzles that are generally quite solvable, although a few had me stumped. 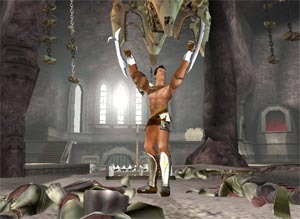 Graphically, Gladiator: Sword of Vengeance is a very impressive game on the PlayStation 2 that not only contains some high detailed graphics but also some amazing special effects, lighting and of course, some great pre-rendered CGI-cutscenes. The main character, Invictus Thrax is well modelled and animated and although he doesn't contain too much detail, he moves with human-like fluidity and also has a bag of amazing special manoeuvres to show you just how gruesome the Roman times were. Apart from Thrax himself, the other enemies that you encounter in the game also contain a fairly high polygon count for that extra realism such as Medusa herself or the deadly Minotaurs. The backgrounds of the game contain some amazing gaming environments to some mediocre ones such as the deep caverns or the Alesian fields. There are also some nice small touches in the game such as moving grass, some rough water effects and of course some brilliant pre-rendered CGI cutscenes that simply look spectacular. The character acting of Gladiator: Sword of Vengeance sounds like it has been taken directly from a low-budget Roman movie (not that this is a bad thing), the main villain in the game, Arruntius is extremely cheese but he does have a layer of danger to his voice. Apart from Arruntius, Invictus Thrax and the various gods that you encounter are all well acted and help immerse the gamer into this dangerous world. 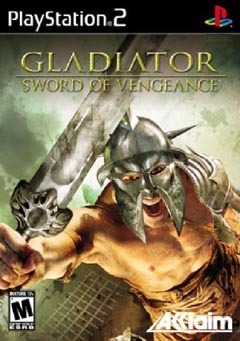 Musically, Gladiator: Sword of Vengeance sounds like a Hollywood blockbuster movie that really helps get your adrenaline pumping, especially when the odds are against you. In conclusion, Gladiator: Sword of Vengeance is an entertaining game that unfortunately brings nothing new into the world of gaming. The graphics of the game are generally quite good but certain levels look quite Spartan as is the gameplay of this title that does become quite repetitive and is not helped by the unfriendly save system. If you are looking for some mindless entertainment, than Gladiator: Sword of Vengeance is the game for you but if you want something more strategic in your gaming diet, than you might want to pass on this title.